Our school has focused on teaching fluency this year. If students can't read fluently then taking standardized tests is a terrible experience (I know it's not fun if you can read either, but it's much worse when you can't)! As a special education teacher I have watched frustrated students skip the reading and fill in answers, try to read and give up, and even seen them in tears because they felt so bad about not being able to read the test. It is very hard to motivate someone to read for pleasure or enjoy a book when they struggle so much to read the simplest books. So while I still focus on comprehension during mini lessons my biggest goal is to help my students become good readers so that they can actually read the passages they are expected to read on tests, and more importantly to me they can learn to enjoy reading! 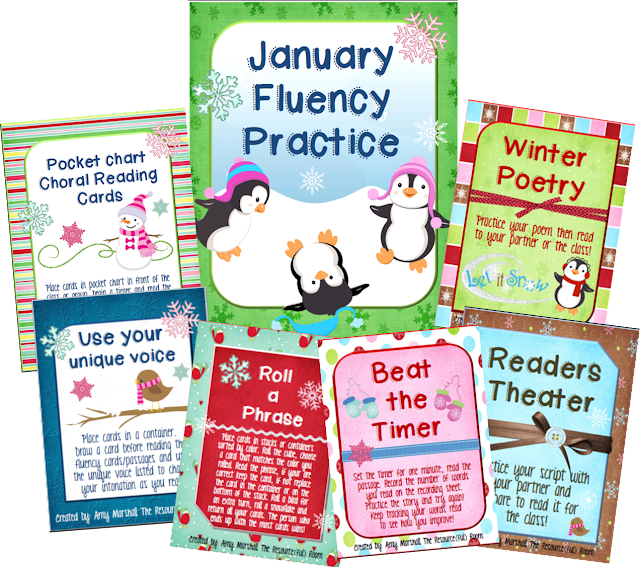 My brand new January Fluency Packet includes six activities that can be used in small group or centers to help students practice their fluency! 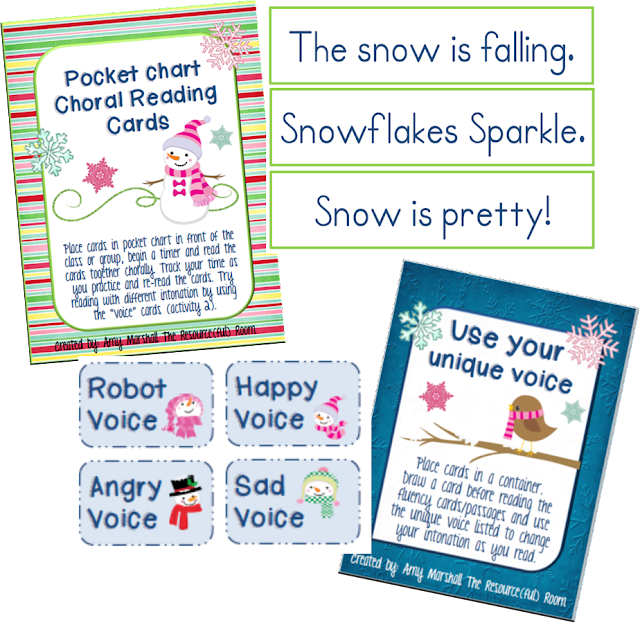 Pocket chart choral reading cards, I use with small groups and then place in a center with some pointers. We use the voice cards to practice changing our intonation as we read, the kids really love this! A Roll a Phrase game all about winter. Students will get lots of practice reading sentences that have different punctuation, I always point out to them that the question mark, exclamation point, and period mean different things, and those sentences should be read differently. 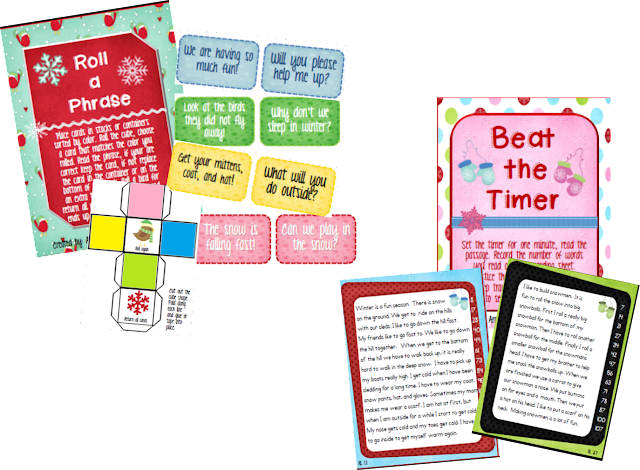 Beat the timer includes five original passages for first and second grades, students read and re-read tracking the number of words read in one minute! It's so fun to see their excitement as they improve with each new read. 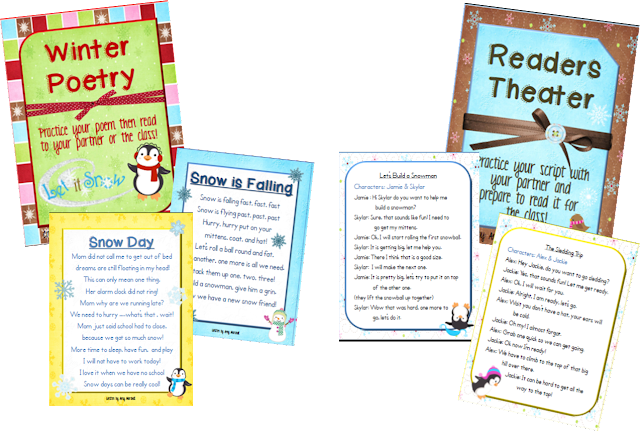 The winter poetry set includes five original poems for students to practice and perform for each other or the whole class. The readers theater also includes five original scripts for partners to learn and perform. Lots of chances to practice reading fluently with each of these sets. All you need are some fun pointers and timers to get your kids practicing reading! All the passages and phrases are about winter fun! My students have loved using them this week! If your students need to practice their fluency then come on over to my TPT store and pick up this package it's on $4.50!! You can get there by clicking on any of the pictures above. Stop by my blog for a freebie from this pack! !